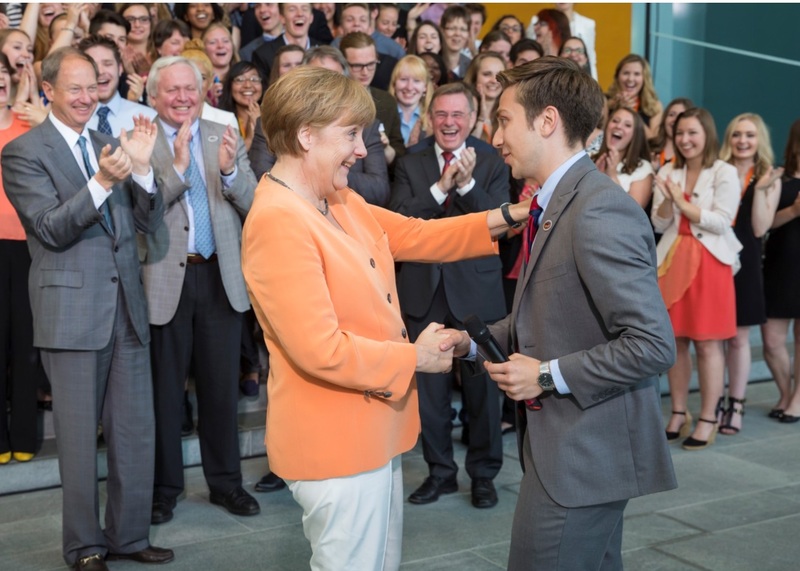 German Chancellor Angela Merkel greets Congress-Bundestag Youth Exchange (CBYX) program alumnus James Roldan after his presentation of "The Great Exchange," a musical about a year in the life of an American exchange student in Germany. Merkel has been chancellor of Germany since 2005, the longest-serving head of government in the European Union. This year’s Fulbright ceremony marked another first – it’s the first time the event has been held outside of the United States. Merkel received her award in Berlin on January 28, 2019. As the latest Fulbright Prize winner, she joins good company: Nelson Mandela, Jimmy Carter, Corazon Aquino, Mary Robinson, and Bill and Melinda Gates have also received the Fulbright Prize. Did you know? Fulbright exchange participants are exchange alumni and eligible for membership on this website, International Exchange Alumni (IEA). If you are an exchange program alumni and did not receive an email inviting you to join, use this form – https://alumni.state.gov/account-inquiry – to let us know.